When digging up the crispy remains of this year's bean plants over the weekend, I discovered what looked like the remains of this year's ladybugs under a layer of leaves. The beetles' legs were curled up beneath them and they didn't move when I picked them up, but they probably weren't dead like the bean plants, but simply hibernating. More accurately, ladybugs enter a state of diapause in the winter, which is a deep hibernation that is only broken out of when specific stimuli are present. In late fall, the beetles store fat reserves on which they can survive for up to nine months. They then find a sheltered place to spend the winter, such as in piles of leaves or logs. 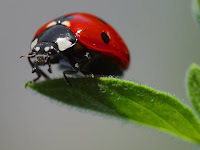 This is the time when confused ladybugs typically enter your house, looking for a place to spend the cold winter months. Ladybugs end their hibernation period when the temperature reaches about 13 degrees Celsius, when food generally becomes available again. At this point, they may again mistakenly enter houses, but just put them outside if you find them, and they will happily (and voraciously) consume many insect pests. To encourage ladybugs to make a home in your yard, you may want to leave some undisturbed leaf litter or mulch for them to burrow into for the winter. And if you're a young girl in central Europe, a ladybug on your hand means that you will soon be married! I have a ladybug in my apt. now and it is about 32 degrees F outside, which I think is too cold to put her outside. What should I do? I gave her some water. You can try keeping the ladybug as a pet over the winter. You can feed it moistened raisins or bananas, but usually they live off of fat reserves over the winter. A good way to give them water is to moisten a paper towel so they don't drown in it. I've never tried keeping a ladybug over the winter, they don't seem to come into my house very often. Good luck! I work at a hotel and discovered a multitude of ladybugs by one window. It is fall in the Pacific Northwest and I do not want my manager to have them exterminated. Is there something I can do to keep them safe without causing them any harm? A way to move them that won't kill them?